The reality is that standing desks, although they will make you feel so much better in your day-to-day life, are generally pretty expensive. Not everyone can afford them, and not everyone sees the cost to benefit ratio as being in their favor. 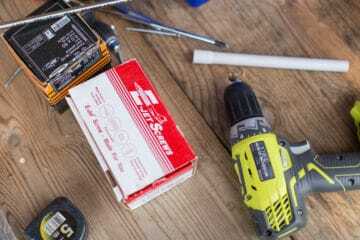 There are definitely different price brackets and some desks come cheaper than others, but there’s almost no doubt about it that if you want something truly cheap that suits your exact needs, then DIY can be a good way to go. If you are a DIY lover, someone who doesn’t mind getting their hands a little dirty, then you’re going to love the standing desk ideas for your own home or office. These DIY standing desks are made from simple materials that you’d be able to find at any hardware store, and for a fraction of the price, you can build your own standing desk. 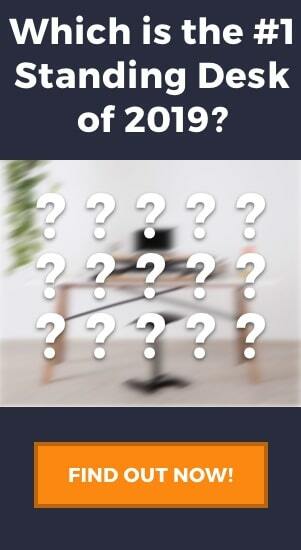 DO NOT MISS: Take a look at the best height adjustable standing desks of 2019. 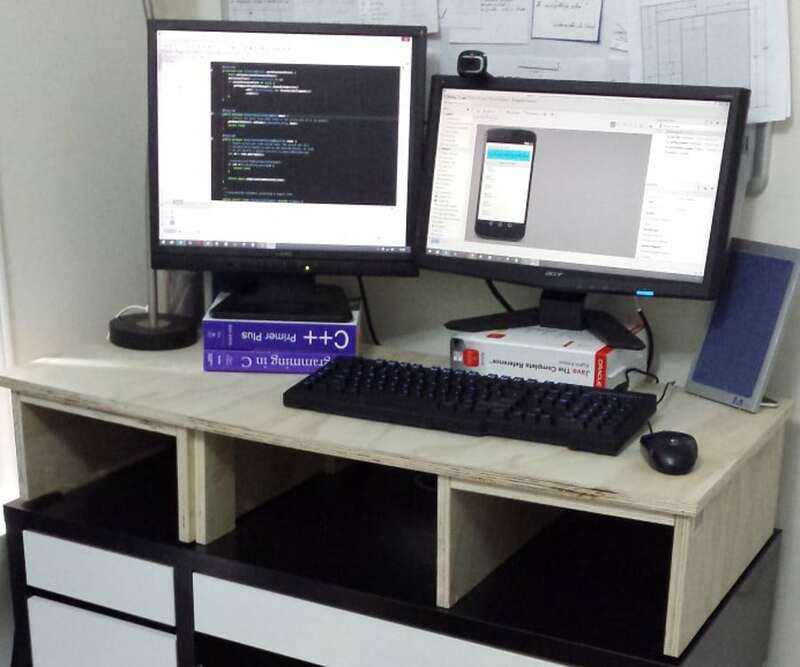 In our first example of a basic DIY project you can tackle at home, we see a simple yet effective standing desk converter. 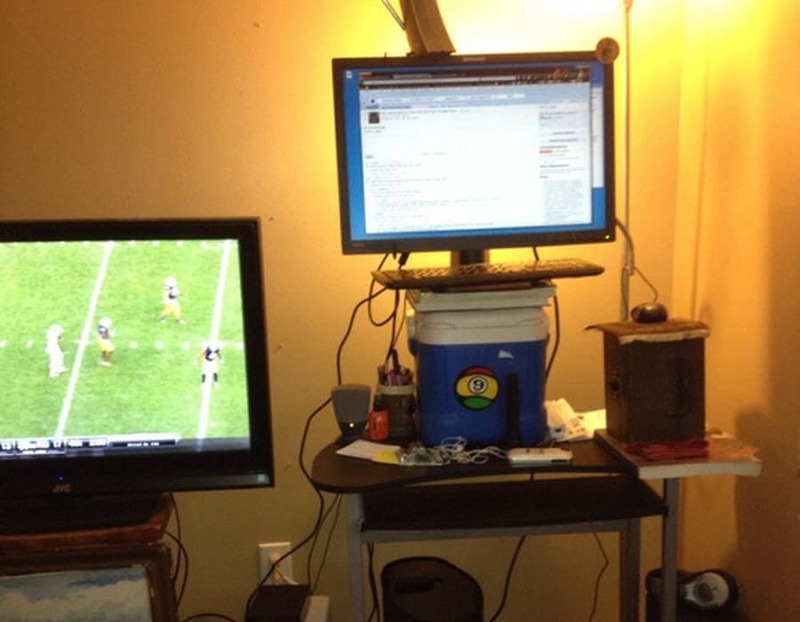 Unlike most standing desk converters, however, this one is not adjustable. One benefit it does have however is the additional storage space between the original desk and the new desktop. This project is among the most basic projects you can try. The only material you need is plywood, and you can get away with on using nails and a hammer, some screws, and some wood glue. Also, if you like to paint you can add paint to your list to finish this desk in nice colors to help it fit in your office. 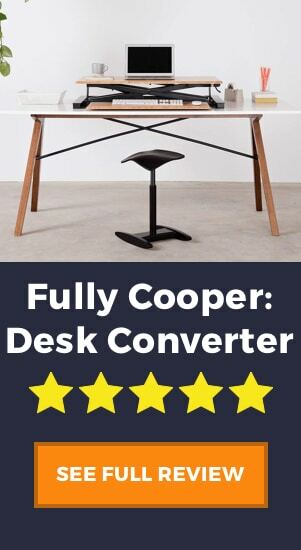 As you can see from the image, the design creates large areas for storage between the desk and the converter, making actually more useful than your standard adjustable standing desk converter. Many people complain of the desk space that desk risers can occupy, so this is a clever way of getting full use of desk space on both the surfaces. The other major benefit of DIY, not just for this desk, is being able to set the perfect height for your keyboard and monitors, creating a more ergonomic result. This DIYer has gone as far to raise his monitors with books, a DIY monitor stand to make sure the monitors are at eye level. The last reason we think you should give this DIY standing desk converter a try is the fact that it is easily removable. Although it isn’t fully adjustable, allowing you to switch from sitting to standing easily, you can just remove your computer and then the converter to go back to a regular sitting position. As we have said a couple of times now, the only thing that is really missing here is the ability to adjust the unit easily. Many people like to switch from sitting to standing throughout the day, and if you have to remove everything from your desk to do so it would be a bit of a pain! What you could do however is create something like this for only half your current desk, so one half could be the standing desk, and the other half would be your sitting desk. To make this work even better you could easily attach a mountable monitor arm to the plywood so the monitors could be used at the right height on both sides. Source: take a look at the full album of design and building steps here. We are going to start this one off with a big “kudos” to the original designer and maker of this DIY desk! A huge difficulty in building your own standing desk is making it adjustable, and this design has managed to do just that. It is unique, takes up minimal space, and perfect for people who want to move up and down regularly during the day. As we said, you should give this project a try if you are looking for a simple yet effective adjustable standing desk. Using a center pole made out of metal for the structure, and plywood for the keyboard tray and monitor shelf, you can achieve a minimalist design that would fit in any office of home. Add a quick coat of paint and you have yourself a designer desk that everyone would envy. Unlike many standing desks options which a large and relatively cumbersome, this DIY project results in a desk with a small footprint that can easily be placed up against a wall and would not take up much room at all. This may be an issue for people who require the extra desk space, but if you only have a keyboard and monitor then you can save so much extra space with this design. Finally, we love the fact that you have two separate shelves for the keyboard tray and the monitor. If you look at our other reviews of the best standing desk converters, you’ll notice one thing in common: ergonomic keyboard trays. Being able to adjust your keyboard height and monitor height separately is a huge plus in our eyes and adds several points to this desk’s final score! As noted in the previous section, this table does lack a bit of extra desk space for storage or for papers and documents. It is minimalist in its design and really looks like it is best for this most simple of workstation setups. Another concern could be the stability. Given the desk is only supported by the center pole, there is a chance that the desk couldn’t support heavy weights and if you have a large monitor or desktop computer, you may be wary placing these on the upper shelf. Source: take a look at the full album here. Here is an awesome short video that will teach you how to build a semi-adjustable full standing table with minimal tools. This video shows you just how easy and cheap building a desk can be from scratch, and if you are comfortable with a few power tools then this design will be a breeze. The design is simple and cheap. Finding somewhere that sells piping and lumber should be easy enough, then you just need to create the desktop and fit the pipes and away you go! Also as we mentioned before, we would call this desk “semi” adjustable, as it can’t really be changed as easy as a height adjustable standing desk, however, if you buy pipes in various sizes you can screw on and off the different lengths to suit whoever needs to use the desk. One of the issues of this design is the lack of keyboard tray, so an addition that you could make is adding either a separate level for a keyboard or simply using an adjustable monitor arm to adjust your monitor screen height properly. Also, in terms of stability, it could be a good idea to add additional crossbars. Generally, a table at higher levels like this will be more shaky and unstable, so a crossbar should help mitigate these issues. Source: take a look at the original post. Sometimes the most simple solutions are the most effective! 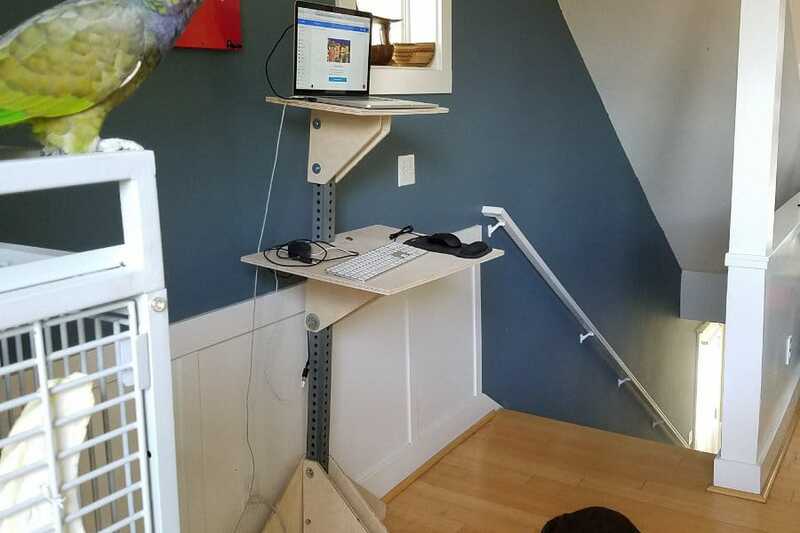 This one is definitely cheap, definitely simple, and absolutely anyone could do this to create their own standing desk, no matter what your DIY skill level is. The thing we love most about this idea is that when some people see the word “DIY”, they suddenly put it in the too-hard-basket! This is such a shame when really such a small amount of effort like this could bring you such huge gains to your comfort and physical well-being. A standing desk doesn’t have to be expensive or difficult to make, it can really just be a couple of boxes on top of your desk. Another thing that is great about cardboard boxes is that they are inherently modular. Need an extra level for your keyboard? Just add a box! Need more space for additional monitors? Just add a box! You could set up almost any desk you like just by adding and removing boxes. Also, this DIYer decided to go one step further an switch one of the boxes for this simple plastic side table, which works perfectly as a monitor stand. In the end, cardboard is cardboard, and its never going to be as durable as a nice laminate or wooden desk. The sturdiness and stability of this idea might eventually not be good enough and dealing with shakiness while you work can be a real pain. Additionally, this idea is not the most aesthetically pleasing. Many people buy standing desks not only for their functionality but also for their beautiful designs. The other DIY ideas in this article have managed to recreate some of that nice design, however, this one isn’t one of them. We give it an A+ for functionality but unfortunately an F for looks. Source: check out the original images here. DIY NOT YOUR THING? 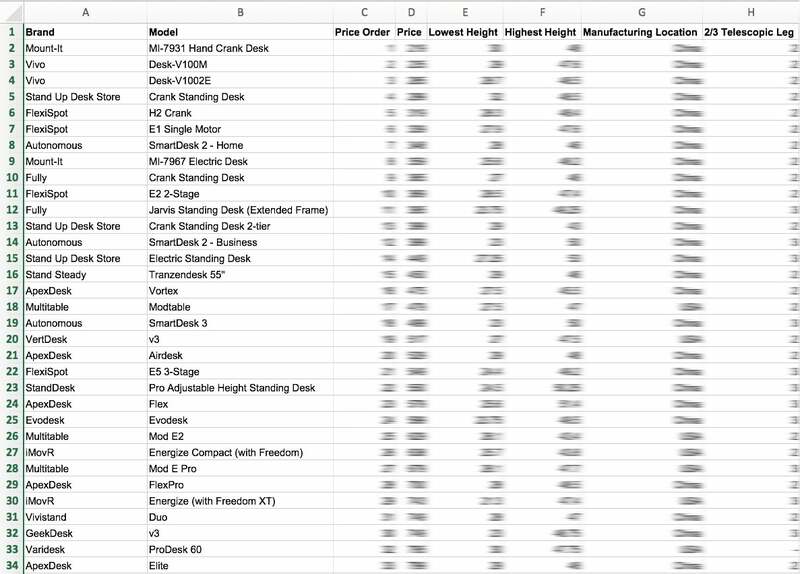 Take a look at our favorite standing desk converters that wont put a hole in your pocket! Among the good DIY projects, there are always the bad. Here we give you some (un)inspiring ideas that will hopefully put a smile on your face and maybe teach you how NOT to build your own standing desk! If you are going to go down the DIY route, we recommend you stay clear of coke can table legs. Oh, but if you do use coke can table legs, then PLEASE stay clear of glass desktops. 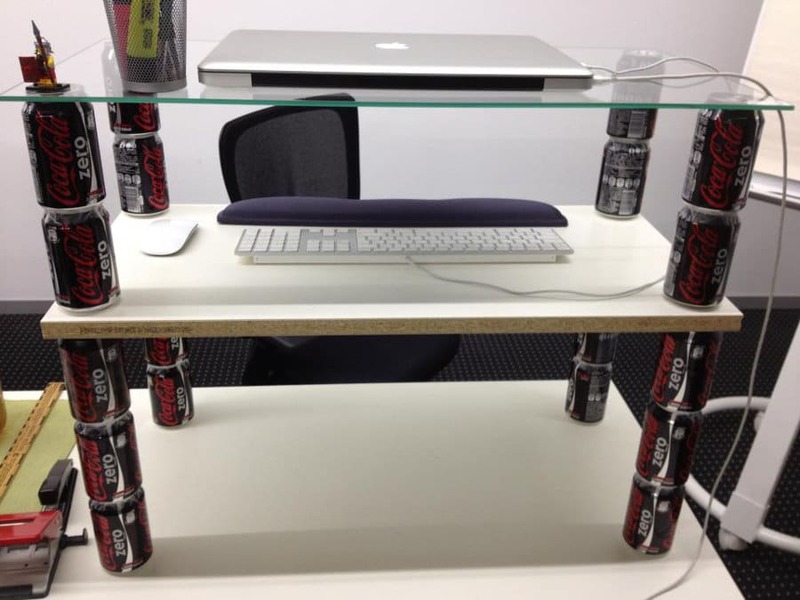 But, if you want to go ahead and build a DIY standing desk from coke cans and glass surfaces, PLEASE PLEASE don’t put a very expensive MacBook Pro on top! When we say this one is cooler, it is definitely NOT cool. Placing a couple of books on a cooler on a desk just seems precarious at best, On top of that add the mix of wires all over the place and you have yourself a recipe for disaster! 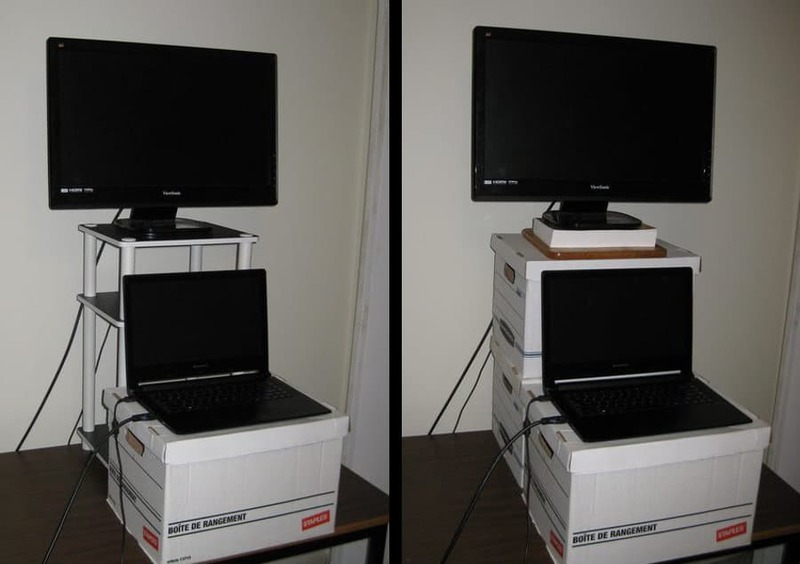 If you are going to go this route, take a look at the even simpler, and much more effective, cardboard DIY standing desk converter from the previous examples, it will give you far better results! To finish off, we just want to wish you the best of luck trying out some of these designs. DIY projects are fun and a good way to build yourself a desk that will fit your exact needs. On top of that they can be a cheaper alternative to some of the products on the market. Nevertheless you should always be careful when trying one of these projects and make sure you try follow all instructions clearly. Have fun and happy DIYing!